Half mill could help electricity generating drone startup's lofty ambitions to take on Google. 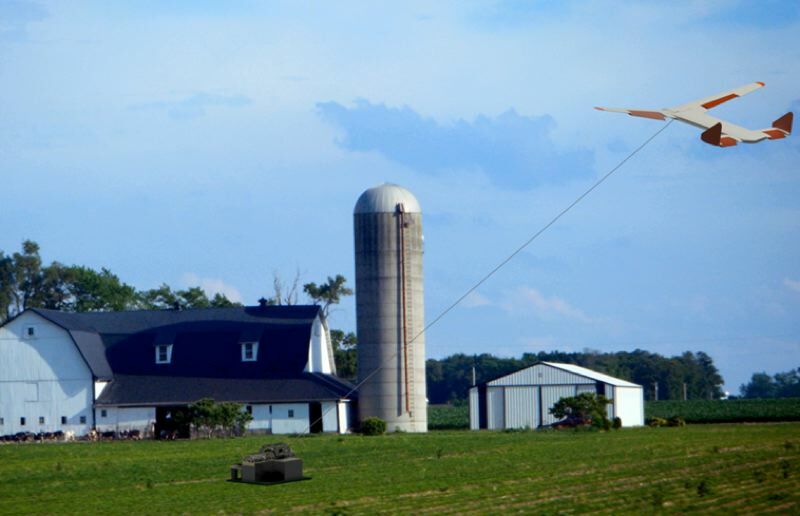 EWindSolutions, which makes tethered drones that generate electricity from wind power, recently received a $600,000 U.S. Dept. of Agriculture grant to keep on what it is doing. The grant brings total USDA funding to $1.4 million for the airborne energy harvesting system, whose headquarters are in Beaverton. EWind's drones or kites are like tethered gliders 12 feet across. As the wind picks up, the tether unspools from a drum. At a few hundred feet up, where the wind is fresh and constant, the drone thrashes around in a figure 8 pattern. This pulling generates electricity in the drum/turbine. When it is time to reel it in, the foils alter and the kite glides in. The drum reels in the tether using far less energy than it previously created. The drones are aimed at farmers who need a second power source, and give a better return per acre than solar, according to David Schaefer, the founder and CEO of eWindSolutions. 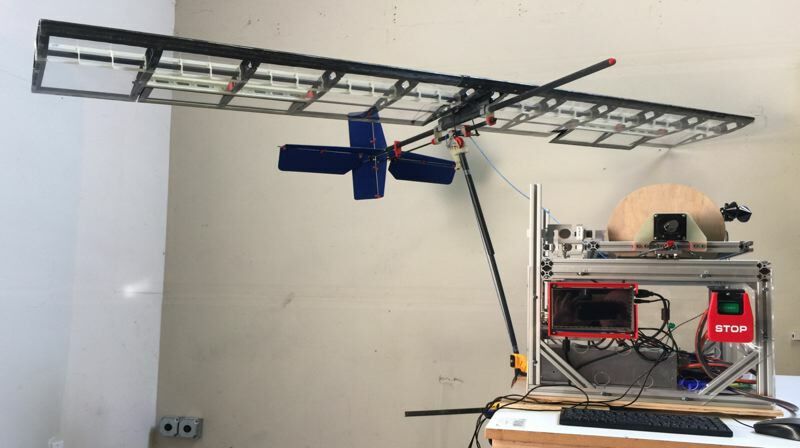 The goal is to create a kite that generates 45,000 kilowatts per year, enough for each drone to power five homes. For Shaefer the grant enables them to keep the lights on for another year, but it also highlights the difficulty of being a startup trying to do something original in renewable energy. Grants are good because there's less pressure than comes with private investment. "People invest with people they know. We're all on our first startup," Schaefer told the Business Tribune. "Investors want something sooner. Grants are decent money, but you don't know when you'll get it. It cycles up and down. You get to the end and it's going to be tight for a while." He said they've had dry spells before, but are now on their sixth grant. Grants, however, are great when you aren't tapped into the investment community. Applying for grants can take up a lot of time that could be spent designing kites, electrical distribution systems and writing software. It takes about a week to write a grant now, but the first time it took two months. "Everything has to be right, the font size, the margins, the number of pages....There's a boatload of things they look for. You submit two dozen pieces of paperwork, then it goes through an automated process." One slip could lead to rejection. "We have people writing it until the last minute. Then you submit and watch the hourglass spinning, because everyone else is submitting at the last minute too." A further wrinkle in things is that the USDA has a whole department that deals with finances, and with so many baby boomers retiring it is understaffed and moving slowly. Schaefer says trying to find the right person to talk to can be difficult. A grant goes through a commercial review and a technical review, with usually a four-person panel on each side. Shaefer writes the project narrative, others at eWind Solutions do the budget. Retaining staff is tricky. "No one is going to get rich at a startup based on grants. I'm making half the salary I made at Xerox," he says. "We're doing it because we're passionate about it." phase two of the ground station, the Proof of Concept. They are working on the best generator, building critical components and doing performance monitoring. They'd prefer to work on the most difficult problem — how to launch the kite in the lowest possible wind speed. "The USDA says that's the roof. We need to work on generating power and controlling the tether. It forces us to be more sequential." If they had more money they could hire a software developer to write a mobile app with wireless control. That way the farmer could just control the kit from his phone. EWindSolutions is definitely looking at selling to small farmers, from wine makers to in California to farmers in the developing world. At the biannual Airborne Wind Energy Conference in Freiburg, Germany, in 2017 they heard from a research firm that there were only 14 companies that could crack the issue. Other firms want to go high, over 500 feet, where they need special exemptions from the FAA. EWind wants to compete closer to the earth with common wind turbines. "The industry is in turmoil, buying each other up. We're going after that market, the low-hanging fruit. And we'll produce four times more power than comparable systems." They had some good news that could advance their work at little cost. Google bought Makani, which has a kite with a 100-foot wingspan that flies at 1000 feet. It generates electricity in the air and sends it down the tether. EWind wants to compete with them. "Google's chief engineer left, a flight controls guy, in Boulder. And he's going to help us, for free."